In modern homes today, almost every home has a dining room. This room is usually considered the formal place to dine during special occasions and events and is usually only used for that purpose. The kitchen is often used for the everyday family meals, however, it wasn't always like that. During the Victorian and Edwardian eras, families never ate in the kitchen. It was considered disrespectful to have breakfast, lunch or dinner anywhere else except for the dining room especially if it was without your other family members. The main belief during this time was that eating was a family experience that should take place with all members together. The appearance of the dining room was grand, to say the least. It was also one of the largest rooms. The ceiling height would vary with each house, but the addition of beautiful carved molding graced the top of all walls. The floors were usually made of pine boards and a dark, rich fireplace provided warmth as well as a focal point for diners. The furnishings and decorations during the eras took on more of the British style. Usually the dining room had light colors, but that changed during the middle of the Victorian period when the introduction of warm colors such as maroon and dark greens became popular. After the change, the typical colors used in the dining room would be dark colors, unlike the parlor which would have a light and feminine look. This is why the dining room was considered more of a male-inspired room. The furniture found in dining rooms during the Victorian and Edwardian eras was always intended to provide a sense of elegance but at the same time provide comfort to the users. The furniture was almost always made of heavy dark woods such as oak and mahogany. Instead of having a feminine appearance, the furniture would have strong lines and less decor which helped provide the overall male look to the room. Dining tables were large and came in a variety of styles circular, square or rectangular. The tables did not have any details on the top since tables during that time were always covered with a tablecloth. During this period, there would be one master chair and then a variety of regular chairs. The master chair, also known as the Carver chair, was made for the man of the family. This chair would be a larger chair with arms. The other chairs would be more simple and would be used for the lady of the house as well as other family members. Around the dining room would be extra chairs, also known as surplus chairs. These would line the walls around the room and could be used in case of a dinner party or guests. Besides the dining table, another important piece of furniture that graced the dining room was the sideboard. The sideboard had cupboards, drawers, shelves and also a mirror. This is where dishes were placed for the servants to serve from during dinner parties. Around the room would be paintings and on the windows would be lace curtains. Most families would keep at least one large plant next to the window. Also, it was not uncommon to find a vase full of fresh-picked flowers at the center of the dining table. 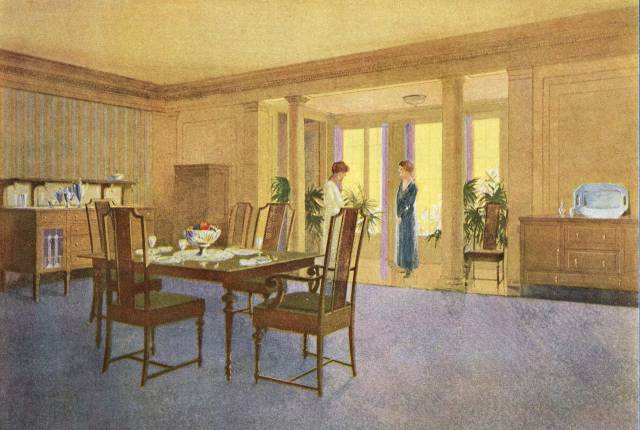 Unlike the parlor, the dining room was more of a male-focused room. Although this has changed through history, the antique dining room furniture that can be found from this era still shows the strong, masculine influence that made the dining room one of the most elegant and sophisticated rooms of that time.